The Archbold Buckeye has asked that our students in grades K-12 wear your Pettisville Blackbird shirts to the Fulton County fair on Sunday so it’s easier for them to spot you to take pictures they will print in the newspaper. So, show your Pettisville pride and wear your Blackbird shirt to the fair on Sunday. Spanish Club trip meeting will be today during Activity period. Meet in Sra. Richer’s room. Pizza sales continue through Sept. 18th. Activity Period will be this afternoon from 1:55-2:25. Spanish Club will meet in Sra. Richer’s room. FCCLA members who are not in Spanish Club should to go Mrs. Bacon’s room. 9th graders report to study hall. All other students should report to their homeroom. Attention all students: There is an FCCLA meeting today during afternoon activity period. Please attend the meeting if you are interested in joining. If you can’t attend but wish to join, please sign up in Mrs. Bacon’s room. Which college, whose 2018 men’s basketball team coached by Tony Bennett, became the first #1 seed ever to lose to a #16 seed in the Division I NCAA tournament? If you enjoy this and other interesting bits of information, you should consider joining Pettisville’s junior high or high school quiz team. For more information, please see Ms. Dorosz or sign up outside her door by tomorrow. And if you’re still trying to figure it out, it’s the University of Virginia. If you burn about 30,000 joules per minute while mowing your lawn, how many joules per second is that? If you enjoy this and other random trivia questions, you should consider joining Pettisville’s junior high or high school quiz team. For more information, please see Ms. Dorosz by this Friday. If you’re still guessing, the answer is 500 joules per second. The varsity soccer team defeated the visiting Knights from Otsego last night by a score of 5-1. The JV volleyball team was defeated by host Hilltop last night in 2 sets. The varsity team picked up the road BBC win in four set with scores of 19-25, 25-20, 25-12 and 25-13. The 8th grade volleyball lost to Hilltop in 2 sets. The varsity golf team picked a BBC win over the visiting Cadets from Hilltop by a score of 176-204. Congratulations to the senior class representatives: President – Peyton Miller; Vice President – Lindsey Crossgrove; Secreatry – Starr Kessinger; Treasurer – Madelyn Krueger; Student Council Reps – Madeleine Wixom, Detric Yoder and Bekah Liechty. The Archbold Buckeye has requested that all our students in grades K-12 wear Pettisville Blackbird shirts to the Fulton County fair on Sunday so it’s easier for them to spot you to take pictures which they will print in the newspaper. So, show your Pettisville pride and wear your Blackbird shirt to the fair on Sunday. The Junior high soccer team lost a close match with Maumee Valley Country Day last night by a score of 1-2. 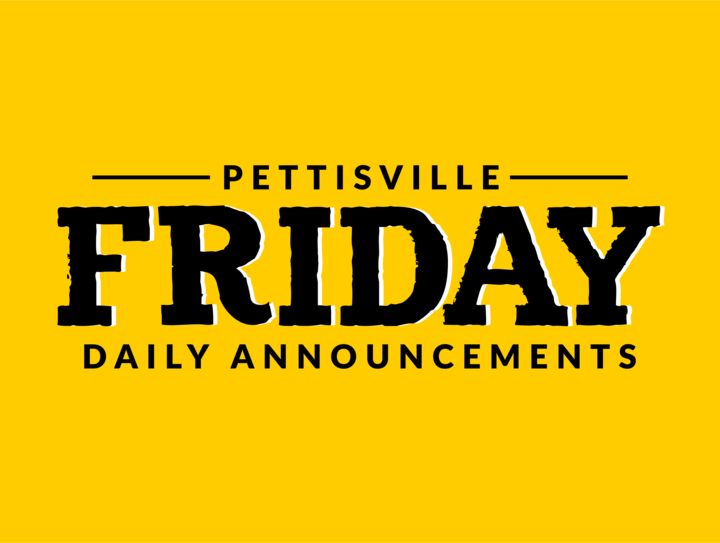 What word means both “someone really funny” or “a violent clash between demonstrators and police?” If you enjoy this and other interesting bits of information, you should consider joining Pettisville’s junior high or high school quiz team. For more information, please see Ms. Dorosz or sign up outside her door by this Friday. In case you’re still trying to figure it out, the answer is "riot." This man co-founded what is now the March of Dimes and his dog, Fala, was considered “the most photographed dog in the world.” Name this 20th-century U.S. President who, in his first acceptance speech, said, “I pledge you, I pledge myself, to a new deal for the American people.” If you enjoy this and other random trivia questions, you should consider joining Pettisville’s junior high or high school quiz team. If you are interested, please sign up with Ms. Dorosz by this Friday. The sign up sheet is on her door. Oh, and by the way, the answer is Franklin D. Roosevelt.